Inviting cafeteria furniture can make a big difference in everyone’s day. Having a nice place to sit down and enjoy a meal before running back to classes or work can help people return to the busy day refreshed and ready for productivity. What kind of cafe furniture is ideal? Hertz Furniture’s huge selection lets you enjoy stylish and functional choices to suit any space. Choosing the right cafe furniture is all about seating and tables. There are lots of different styles to choose from. Some options include tables with attached seating and some allow you to choose independently. You don’t have to stick with classic cafeteria tables anymore, there are lots of modern alternatives that can work well in your space. What is a good alternative to cafeteria tables? Booth seating is a stylish option for your eating space. Cozy benches let people enjoy a nice meal together and fit the attached table perfectly. With a selection of booth styles in both laminate and fiberglass, you can enjoy this option on a budget of any size. Dining booths are appealing because they make people feel like they are in a restaurant rather than a cafeteria. An additional option that is a great alternative to classic choices is cluster seating. With chairs that are attached to the table, there is always the perfect number of seats and they are always a good height. Swivel chairs with automatic return are easy to get into and keep your space looking organized without requiring any extra effort. 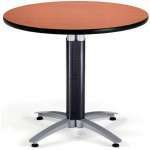 Cluster tables come with laminate or steel tabletops with a number of sizes to choose from. What kind of tables are good for the cafeteria? Cafe tables aren’t just for restaurants, they can also be used in a lunchroom or lounge area. Smaller, more intimate eating spaces make it easier to take a few minutes out of the busy day and enjoy some quiet eating time. Counter-height cafe tables are nice because they enhance privacy and make any space feel like a cool coffee shop. There are lots of different shapes and sizes to choose from so you can mix and match to provide a variety of different spaces. Bistro tables can also be moved around and rearranged when you need to use the space for alternative purposes, clean up, or even if you just want a new layout. Which chairs fit well in a cafeteria? The right chairs for your lunchroom will depend on which tables you choose. 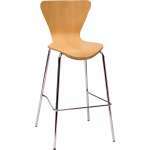 Counter height chairs are ideal for higher cafe tables. They come in lots of cool contemporary styles. You can choose from wood, steel or laminate. Many options have padded seats for enhanced comfort. Standard height cafe chairs are available as well and they fit beautifully with the bistro tables in our collection. What are cafeteria tables made of? 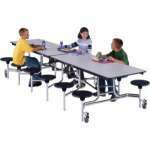 There are lots of different options when it comes to lunchroom tables. The most common choices are particleboard core and plywood core. Plywood is definitely more durable, and a worthwhile investment if you plan on using your tables for the long term. Particleboard is a more budget-friendly option but is not ideal if you are able to spend a bit more. What shapes do lunchroom tables come in? The most common shapes for cafeteria tables are round, rectangle and oval. In addition to choosing the shape, you also have different seating options. Most people think of long benches when it comes to the lunchroom, but there are also models with attached stools and even some options with built-in chairs. 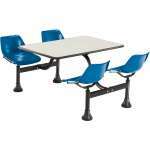 Give your students or employees a great eating space with cafeteria furniture from Hertz Furniture. With so many options when it comes to seating and tables, you are sure to find a great choice that fits your space, style and budget. For complimentary assistance with layouts, design and sizing, contact the experts on the Hertz Project Solutions team.